Man Fuel Intro: Hey everyone, this post is written up by one of my best friends, Flex, who discovered his own passion for making breakfast and mastering certain staple recipes. In this post he covers basic Buttermilk Pancakes with a few insider tips and a great set of variations at the end of the post for how to turn these basic pancakes into pumpkin, oatmeal, or cornmeal variations. Flex: I’ve always been a big breakfast person. I’ll eat it any time of day. So, I had some experience here and there making pancakes from scratch, but they were hit or miss. During the early weeks of my wife’s pregnancy, my wife had an aversion to egg dishes. However, she was still able to eat things with egg in them if the egg was not prominent. Thus, started my weekly ritual of making pancakes every Saturday morning from early 20 to December 2010. I would start off pulling components from various cookbooks and websites, then combining elements of different recipes. In order to keep myself from getting bored with it, I’d throw in variations like: lemon ricotta, pumpkin, sweet potato, oatmeal, fruit, no fruit, sour cream, or yogurt, with some successes and some failures. I wanted to share some of what I’ve learned to give people a jumping off point for basic pancakes that they can then use to “riff” or adapt to individual taste. My hope is that I can convince at least some of you to never bother with boxes of ready-made pancake mixes. Even though it may seem like a lot of ingredients or directions, there really aren’t that many steps unless you’re going for something more complex (like soufflé-style pancakes, which you can maybe see in a later post). Here, I’m outlining a master base recipe for pancakes but will throw in some ways to make variations at the end. 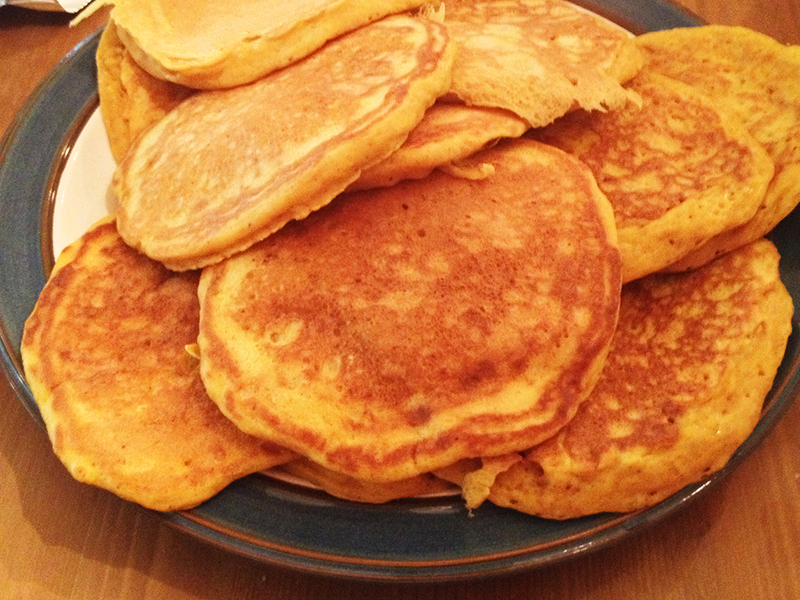 The pictures included in this post are of the pumpkin pancakes I made recently, so don’t get confused if your regular buttermilk pancakes look differently. Enjoy! 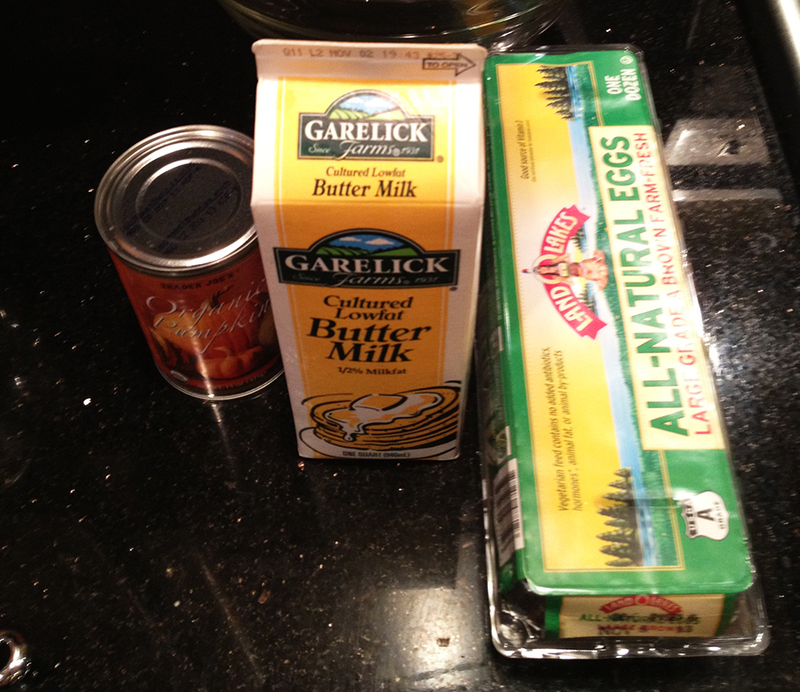 Basic Buttermilk Pancake Recipe: Makes about 14 pancakes at about 108 calories each (not including butter or syrup). Note: I try to get aluminum-free. It has no effect on taste, but why eat aluminum? Man Fuel Note: Coincidentally, baking SODA has no aluminum in it whatsoever despite the labels, so don’t be fooled by the marketing hype! Note: Buttermilk is king when it comes to making pancakes, but often I don’t have it on hand. Instead I’ve often substituted a mixture of 1 cup milk with a 1/2 cup plain yogurt OR 1 and 1/2 cups regular milk plus a couple of tablespoons of white vinegar mixed together and allowed to sit for about 10 minutes. Set up 2 bowls, because you’ll be separately combining all dry ingredients in one and all wet ingredients in the other. Combine all your dry ingredients in one bowl, then mix together to evenly disperse. Combine your wet ingredients into the other bowl, break up the egg yolks, and mix well. Pour your wet ingredient mixture into your dry ingredients. 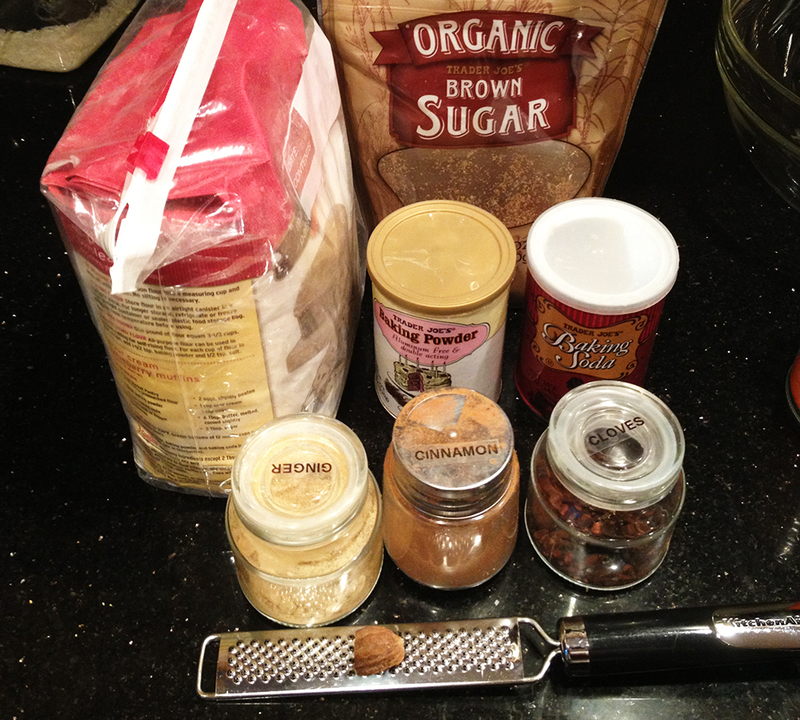 Mix together with a whisk gently and to the minimum extent necessary to incorporate all of the flour. It is important that you do not overmix, otherwise you’ll have tough, dense pancakes. Resist the urge to work out lumps. Heat up your griddle or pan under medium-low or medium heat, depending on your stove. You want it hot enough for a drop of water to sizzle and dance around, but not so hot that it immediately vaporizes. As the griddle heats up, microwave the butter for 30 seconds or so to melt it in a small cup or microwave safe container. 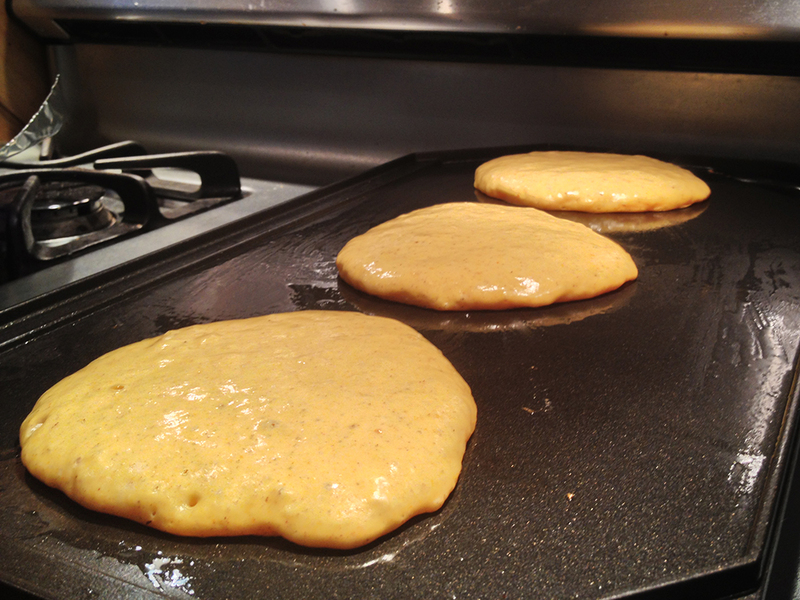 Brush butter onto the entire griddle to keep the pancakes from sticking. Ladle on your pancake batter to make two or three at a time without the pancakes touching one another. Leave the pancakes alone until you start noticing bubbles form and then carefully flip the pancakes using a broad spatula. Man Fuel Note: This is your indicator for when the pancakes are ready to get flipped. Don’t try peeking underneath to see if they’re ready. Just wait for the bubbles to appear on top, and then carefully flip the pancakes. Once flipped, remove them when you have a golden brown color underneath. While you are making the pancakes, keep finished pancakes on a plate loosely covered with foil or warmed in the oven on a baking sheet pan under the lowest heat setting. Optional, but recommended: Microwave some maple syrup (about 10 sec.) Serve at once and enjoy! Use a 1/2 cup of the flour with 1/2 cup of quick-cook oatmeal. Run the oatmeal through quickly a food processor first just to break up the larger pieces into smaller once. Man Fuel Note: I’m betting that some of the dry ingredients from the Pumpkin recipe above (e.g. cinnamon and nutmeg, along with brown sugar instead of white sugar) would give a great kick to the oatmeal pancakes as well! Use 1/2 cup of flour with 1/2 cup of corn meal. 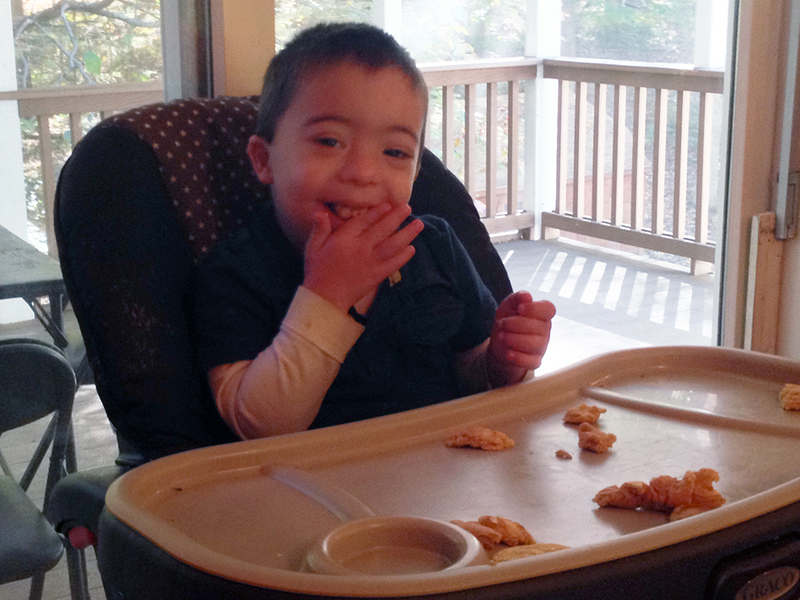 Man Fuel: Here’s a bonus picture of Flex’s son enjoying his pumpkin pancakes! There’s no better testimonial than getting your kids to eat something you’ve made! Thanks Flex for the wonderful recipe. Your son seems to enjoy them a lot. I will definitely try to make them. And yes, they definitely are a yummy as they look! I can attest that Flex does have some good pancake making skills. He once even made them for lunch instead of breakfast and I didn’t hear anyone complaining! Good stuff Flex. I have been missing the nutmeg. Great idea. well played, flex. that photo of your son is absolutely adorable. i’ve never seen a little guy look quite so nefarious whilst chowing on some pancakes. i like the concept of this post a lot, man. anyone can make pancakes, but to make a truly excellent, consistent pancake take a lot of training and hard work. well done. I agree… pancakes look easier to make than they are. Also, the post is worth it just for the photo of Flex’s son at the end!